This set of boat coloring pages includes pirate ships, steamboats, tugboats, and sailing ships from around the world. Check them out! This color sheet features a junk, an ancient Chinese sail boat. 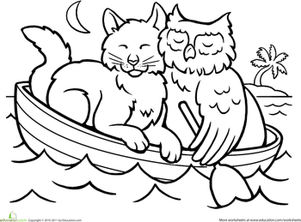 This romantic coloring page features the famous title characters from the poem "The Owl and the Pussycat" by Edward Lear. Step aboard for a trip down the Nile on an Egyptian river boat! Add bright colors to this river scene and make up a story about traveling down the famous river. Encourage your child to think about simple sounds, songs, and sight words with these cute preschool coloring sheet featuring the lyrics to "Row Your Boat". Take a trip down the Mississippi River on this paddle steamer! What colors will you use to show the churning water as it sprays out of the boat's paddle wheel? Anchors away! Get ready for a fun-filled coloring voyage with this cute toy ship. Be sure to review the names of shapes and colors as she goes. Set sail with the Queen's Royal Navy on the HMS Victory ship with this coloring page. How'd this big, burly dinosaur get in such a tiny ship? Make up a story about this silly scene when you're finished coloring. Where is this cruise ship going? 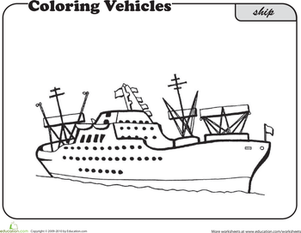 Let your child come up with his own story while he colors in this cruise ship coloring page. Check out this awesome ocean liner! 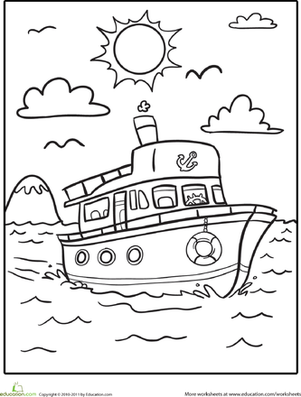 Let your child's imagination run wild as they decorate this ship coloring page. Make way and break out the crayons with this coloring page that features a freighter full of cargo! Once your kid's done coloring, have him count the boxes. Pirates and dinosaurs together? Historical inaccuracies don't matter when the subjects are this cute. 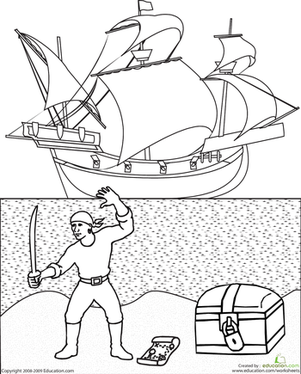 This coloring page features a pirate who needs your child's help to add color to the swashbuckling scene. Can you imagine traveling around the world in a big cruise liner like this one? Color in this massive ship and imagine where you would go as captain.